It’s National Volunteer Week and to celebrate, we encourage all our readers to get your hands dirty for a good cause. Joining a group of people working towards a common goal fosters a supportive community and instills a sense of pride and accomplishment. Volunteer opportunities in our coastal wetlands are abundant as the days grow warmer and longer. Additionally, festivals often recruit volunteers to maintain trash and recycling as well as operations and logistics, urban areas organize tree plantings and beautification projects, and trash cleanups are becoming a popular activity combined with exercise–like plogging. Along the coast, several organizations offer volunteering opportunities throughout the year. Some of the organizations who work on or near CWPPRA project sites are Barataria-Terrebonne National Estuary Program (BTNEP), Coalition to Restore Coastal Louisiana (CRCL), The Meraux Foundation, The Nature Conservancy, and Keep Louisiana Beautiful. If none of these organizations pique your interest, there are bound to be local organizations in your community who need help. Volunteer jobs that specifically benefit our coastal zone are vegetative plantings and trash cleanups. Vegetation is important in wetlands to filter excess nutrients and pollutants, to hold sediment during storms, and to provide habitat for wildlife. Litter is not only an eyesore; even a small piece of trash can have a major impact on the health of any animal that mistakes it for food. Other debris leaches toxic chemicals into the soil, which then accumulate in plant tissues and spread throughout an ecosystem. Even small acts here and there add up, so get out and pay respect to your community. Whether it’s volunteering with an organization or picking up trash as you walk through a parking lot, your small act can go a long way. We appreciate all volunteer efforts because they directly impact our community and strengthen our connection to the environment, even if they don’t relate directly to Louisiana’s coast. We extend a very heartfelt thank you to those volunteers who do more than their fair share to ensure the health of our coastal zone! In honor of National Estuaries Week, we have information on how to care about the health of estuaries near you! Twenty-two of the thirty-two largest cities in the world are located near estuaries, and with good reason. The ecosystem benefits of estuaries are massive, including major shipping channels, fisheries, agriculture, and tourism. The high productivity in these areas means that they are hugely beneficial to societies near them. 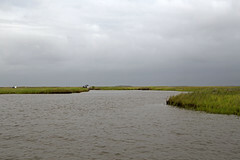 In coastal Louisiana, many jobs and industries are directly dependent on a healthy estuarine system. We in Louisiana are lucky to host one of the 28 National Estuary Programs supported by the United States Environmental Protection Agency (EPA). Each National Estuary Program focuses on a different estuary, each one distinct and complicated, but they all share concerns about water quality and ecological integrity. Together the programs have restored or protected over 2 million acres across the nation since 2000. Our local NEP, the Barataria-Terrebonne National Estuary Program (BTNEP), seeks to maintain the breeding habitat of shrimp, blue crabs, and many fish species that have come to be a huge industry in the state. Other estuaries host different fisheries and different industries, for example the Puget Sound Partnership Comprehensive Plan includes support for salmon fisheries, resident orca populations, and goals for reducing shore armoring. BTNEP is based out of Nicholls State University in Thibodaux, LA, and they have a bounty of information on their website about their work, worries, and successes in maintaining one of the most productive ecosystems on the gulf coast. Anyone interested in protecting and restoring the estuary is welcome to participate in the BTNEP Management Conference which meets three times a year. People can also take part in beach clean ups, water quality monitoring, and local events to highlight recreational opportunities in the Barataria-Terrebonne area. Many other programs and organizations are dedicated to the preservation of our estuaries, including RESTORE the Mississippi River Delta, America’s Wetland Foundation and CWPPRA’s Partners in Restoration. All of these programs understand the issues that threaten coastal Louisiana and the people who call it home.